Combine three adventures in one on this multifaceted tour. First, zipline over the jungle canopy on seven different lines totaling more than a half mile in the air. 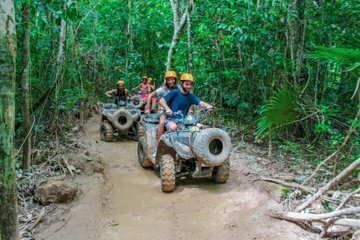 Then take a thrilling ride through the trees on an all-terrain vehicle. Wind down with a swim in a refreshing cenote, a natural sinkhole formed by erosion. Lunch and refreshments are included.